I was wondering who has the highest mileage on their Accord diesel? The only reason I ask is because I am in a bit of dilema having just bought an 2005/55 Accord CTDi with 98k FHSH and not sure wheather I should keep the Accord or sell it and hold onto to my 406 hdi? Now the 406 has covered 155k and has been very good to me apart from the usual service items/replacing the rear shockers it has never needed anything major. I really like the Accord diesel but am concerned about the timing chain issue these cars have? What is your verdict chaps I do cover a lot of miles around 20k a year... I know the 406 hdi can do 300k easily is this the same thing I can say about the Accord diesel or would the timing chain/engine give up? Edited by Tanna, 12 November 2011 - 10:18 AM. Hi,Tanna,I bought two years ago accord with 130k,I know that is plenty miles on 2004,but some cars has more on inthernet.So I desided to buy.I changed already timing chain,bouth driveshafts.Every year I traveling meet mother ,father and friends.This trip is 1381 miles one way.Always I check engine oil,and level the same.I think,that this mileage isn't big.Because diesels engine are more strongest then petrols. I've seen a few Accord diesels with over 200k now without major issue. You have 27k miles to see if the timing chain issue presents itself, I would keep it and look after it. It will look after you. My car had its chain replaced at approx 180K miles just before I bought it. I have the Honda bill which was for approx £1200 quid. How expensive is the chain to change as a pre-emptive measure? I'm in almost exactly the same situation as you; I bought a 94k 06 Accord diesel to replace a trusty 02 VW Bora TDI with 137k on the clock. I'm also going to cover 20k in 12 months. I've nearing 107k now and although the chain is a little noisy if I'm honest, the car has been great. I've taken advice from this forum and undergone the self-servicing route so I can look after it properly at a reasonable cost. The exhaust manifold was changed under warranty and I also paid to have the fuel filter done at the dealer (didn't fancy that task) but other than that, it's just oil and filter every 10k. I'm planning to keep my Accord for a minimum of three years. I agree with Fahad; it's just important to look after the car and I'm sure it will be fine. The Bora, perhaps like your 406, was a tough machine but the Accord is miles better to drive, so I'm happy with my choice. Was the chain noisy at the time your purchased the vehicle or did it happen recently? What oil do you use? I ask this because I think that the 0w 30 Mobil 1 oil in my car is not right for my car as the engine sounds a bit louder and when you look at the dip stick it looks very thin... I think I may change the oil filter and replace the oil with CASTROL EDGE 0W-30 as per recommened by Honda. Tanna as long as the oil meets Honda specs, then no worries. As Fahad has said and I agree, as long as you treat the engine the engine will look after you. Thin is ok, 0W30 is thin and you'll get good mpg. The chain was noisyish when I got it. Although I'd done my homework on this forum before buying, I hadn't really read about chain issues. The car has a full service history but there was a slightly long gap between two of the services with the previous owner; it could be this, or dealers using the wrong type of oil, that caused it to wear. I use LubeTech's EXOL oil now for self-servicing - do a search in this forum to learn more. You buy a 25-litre drum so it's quite cost-effective to do it yourself. The engine has been fine under this regime - certainly not any noisier - and on my daily 80-mile round commute on the M25/M40, I get well over 60mpg. Mines on 176K, runs fine, mine gets oil and filters every 10-12K, a good check over/lube every couple of weeks. Mine doesn;t burn any oil between services. I cover between 25-30K pa. If I'm honest the suspension is probably a little tired/softer than it would be, the drivers seat is worn both in bottom cushion support and the leather itself but other wise its a comfy old bus. Its not an "exciting" drive in the way my last few cars were but it does the job it was bought to do. Edited by sciroccopt, 05 May 2014 - 05:17 PM. 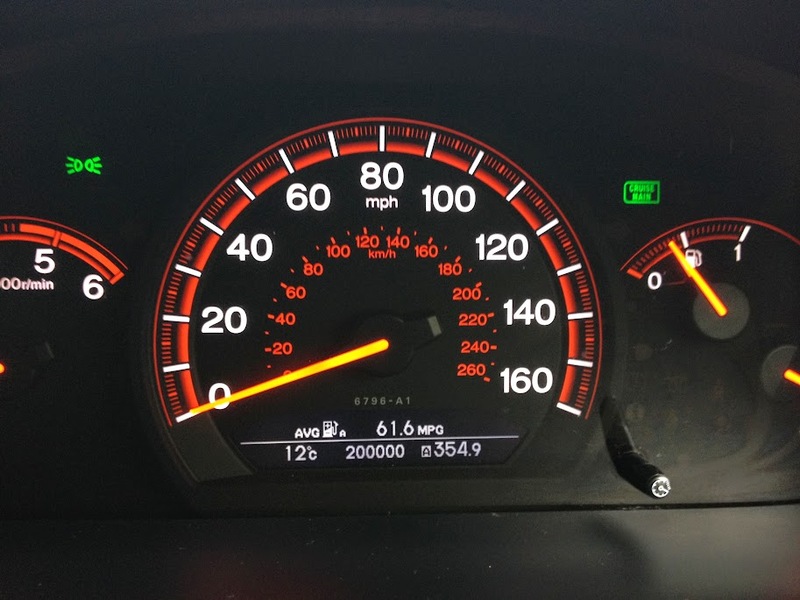 thats a serious milestone, an major issues and how long have you had the car? wow we got some serious miles. but its got the honda badge on it so its going to keep going.. look after it well and its going to be all good.. I've seen many at well over 200k miles but the best one was 475k running a stage 1 egr off remap! It was a local taxi and he went through two clutches and flywheels in around 340k miles of driving in 5 years. And the best bit, original turbo!